Tableau customers have never kept their love for speed-of-thought analytics a secret. Now with our launch of 6.1 and mobile BI, even ComputerWorld and the Financial Times are expounding on the benefits of Tableau. We were thrilled when The Financial Times, often called “the Wall Street Journal of Europe,” covered our Tableau 6.1 release in their regular column, “Tech news for companies.” ReadWriteWeb, Information Management, AppScout, Computer Business Review, Enterprise Apps Today and DBTA also all covered the launch as an example of how BI is getting on the mobile fast-track. In GigaOm’s article “Data for doctors: Big data meets a big business,” Stacey Higginbotham discusses how Seattle Children’s Hospital found the cure for its data woes thanks to Tableau. The director of knowledge management, Ted Corbett, told GigaOm, “So far we’ve saved $3 million out of the supply chain, and using Tableau we can find new ways to eke out more savings.” Now that’s some ROI. And as if all that wasn't enough, we love how publications like the San Jose Mercury News and The Wall Street Journal are using Tableau to get vizzes to the masses. 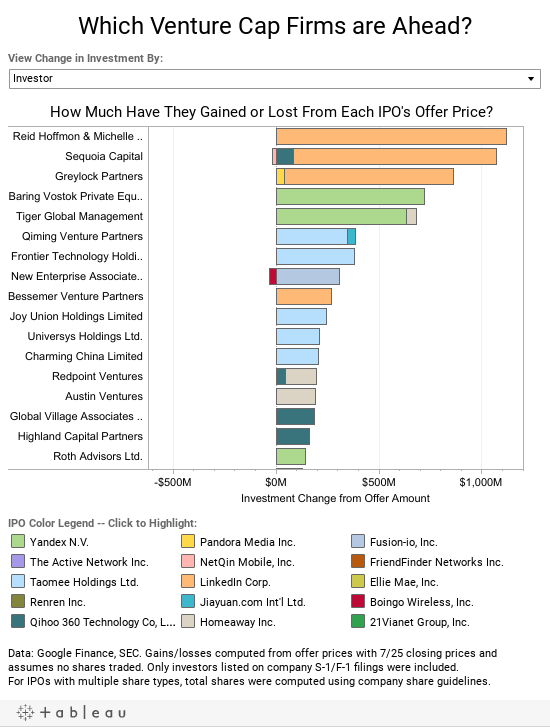 Take a look at the venture cap viz the Mercury News posted, below. We are fortunate to be here to witness, participate and validate - a vision - one that democratizes data and brings with that the possibility of change for the better.